A obsessively tuned, finely crafted shooter that more than recreates the speed and pure joy of '90s classics. Even while calling back to a previous era, Dusk adds on top of those legacies. This is retro first-person shooter perfection, the next evolution in a genre once frozen in time. Long may it reign once again. That really explains DUSK well. This is shooter perfection and something fans of the classics need to experience. Maybe it doesn't redefine what is possible with video games, but it beats out basically every other shooter I've ever played. I know I'll be replaying this for years to come and I look forward to seeing what fans are capable of with mod tools. Honestly, this is purist FPS as good as it gets, just a constantly stunning game. Don’t miss this. It’s the closest you’ll get to that feeling of shooters from yesteryear, and you’d do yourself a disservice as a shooter fan by missing it. Dusk has the backwoods setting of Blood and Redneck Rampage, the forbidding atmosphere and murky palette of Quake, the tight, sharp action of Doom, and the subtle sense of place and interactivity of Duke Nukem 3D. Essentially, Dusk is a retro shooter fan's dream come true. If you want to relive the halcyon days of the FPS genre, a time when games strove to be unrealistic and challenging, you can't get any better than DUSK. Here's hoping for future episodes. Full of memorable moments, fast-paced action, moody set pieces and surprising narrative twists and turns - Dusk may look like a long-lost gem from 1998, when it's actually one of 2018's best. DUSK is a thoroughly unapologetic retro-inspired shooter. It's got flaws, but its excellent combat and emphasis on exploration should see it rocket-jump to the top of every shooter fan's wish list. Dusk is easily one of the best pure-action FPSes to come along in years, mixing gunplay and exploration in equal measure. DUSK is the rare shooter that understands what made games like Blood, DOOM, and Quake so great, and stands beside them as one of the best shooters in years. Dusk delivers an exciting classic horror fps adventure that fans of the genre are sure to love. DUSK represents the return of classic 3D first-person shooters in a magnificent style. Perfect level design, fast action, atmosphere and soundtrack provide players with a great gaming experience.. DUSK can definitely stand among the greats of the first person shooter genre. In an age of photo-realistic visuals and painstakingly-modeled guns, DUSK is proof positive that good old-fashioned shooters can still be relevant and thrilling decades after their heyday. Especially when handled as efficiently as New Blood Interactive has managed. Dusk provides those pining for the first-person shooters of the 1990s with a reason to celebrate, including fast-paced action and buckets of blood. DUSK achieves something that seemed out of reach until now, as it surpasses its inspirations in every way, not only standing shoulder to shoulder with the giants of the genre, but even going beyond that, and creating an adventure that must be experienced by any FPS fan worth their salt. DUSK is love story written about 90s FPS games that perfectly encapsulates everything that was great about the genre in the 90s. 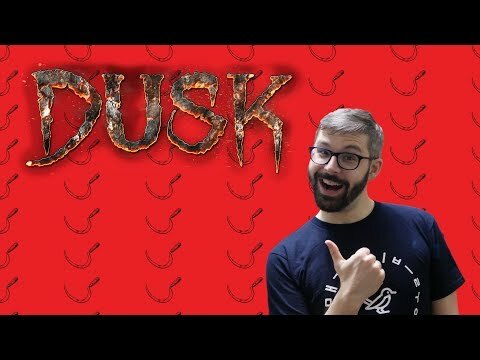 From the pixilated graphics to the classic weapons and gameplay, DUSK is a must have for any older gamer seeking a taste of childhood nostalgia. Dusk captures the essence of those 90s shooters you grew up playing and adds enough new to not only set itself apart, but also stand toe-to-toe with those giants.